Here in Minnesota we also had Gold Bond stamps, but S&H were far more popular. 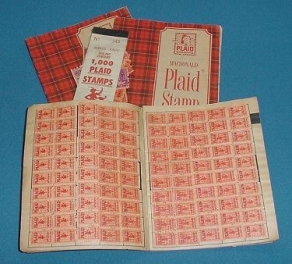 Until now, I had not heard of Plaid stamps. S&H is still around, but it's now called S&H Greenpoints. You amass points from the stores you shopped at, and redeem them on their website for their premiums. Yep, it was Duz all right. The largest box had the bath towel and the smaller boxes a hand towel or dish towel. Bob, you just jogged my memory about "Duz" laundry detergent w/the towel in every box. I was a kid in the 60's, and remember those commercials. This was the same era when you could buy a large size laundry soap powder (Duz?) and find a towel inside the box as a premium. Of course in those innocent days nobody realized that the manufacturer was using the cheap towel to add weight to the box in place of soap! Green Stamps & "FULL" Service all for 20.9 cents a gallon. Sure do miss those days! Growing up working at a 'Chevron' gas station, giving the pretty girls double stamps trying to get a date. I remember when my folks would get S&H Green Stamps, and Blue Chip Stamps. We used to get all kinds of cool premiums. Mom put us to work getting the "tons" of plaid stamp into the booklets. We used a wet sponge......too many stamps to lick. We cashed those puppies in for the lamp in my bedroom and some other items. I think we actually went to a store called "Plaidland". I think Dad got most of them from filling-up at the Mobile Gas Station. (Or did Mom get them from food shopping ??) ....... I can't remember ! We shopped at A&P, they gave out plaid stamps and those stamps got me so many things such as my movie projector (super 8 MM), the screen to view the movies on, a great rainbird sprinkler with brass head and loads of other things for our new home. There were also Blue Stamps but can't recall what stores gave those out. 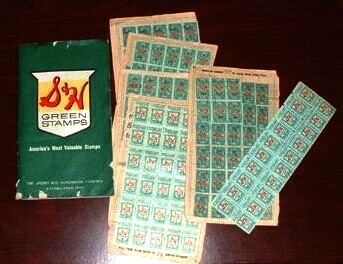 Many a good things were bought with green stamps. I remember pasting them into the book for my mom.